Mark Carrigan interviewed John Holmwood and Sue Scott, Managing Editors of a new online magazine, Discover Society, which seeks to restore social research to the heart of public debate and commentary. By demonstrating the importance of context and social position, sociology can reinvigorate the general public’s understanding of political and individual circumstances. 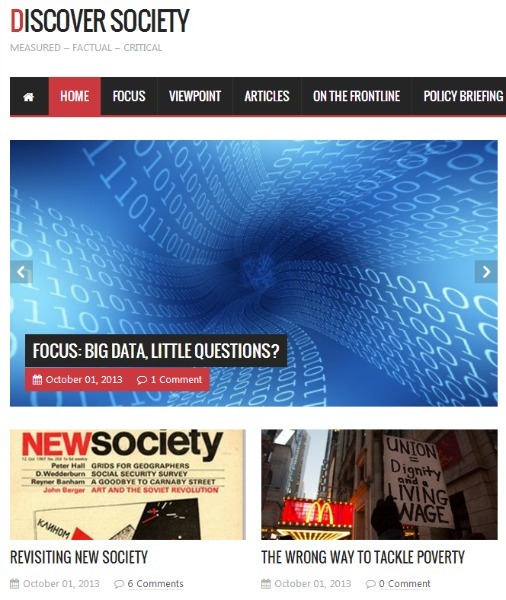 JOHN: Discover Society is an online monthly magazine of social research. However, we would like to publish it fortnightly and we are looking into the possibility of a print version. Essentially, it is a series of short articles written for a general audience that wants to be informed about social issues. SUE: It tries to provide something that is a little more than a ‘blog’, by gathering articles (or posts) together so that they can be read as a set, or more easily returned to than is the case for normal blogs. JOHN: It is something that Sue and I have thought about for quite a while. Along with many others, we have lamented the absence of social research at the heart of public debate. There is a ‘folk memory’ within the disciplines of sociology and social policy of the old days of New Society, which published social research and social and cultural commentary from its launch in 1962 to its demise in 1988 and had contributions from many British academics. SUE: We felt that it was possible to revive the idea in digital form and that while the ‘impact agenda’ encouraged academics to write about their research for wider publics, there weren’t so many venues in which they could do so. Also publications like London Review of Books (which was one of our models for the kinds of article we wanted to encourage, if not for the focus on books) tended to cover humanities and politics, but not social scientific research. Should sociologists be making more of a contribution to debates about contemporary politics? JOHN: Well, we think that there should be a better understanding of the social context in which politics takes place. The title, Discover Society, is an acknowledgement of New Society, but it also invokes Mrs Thatcher’s famous statement that, “there is no such thing as society”. We are providing the opportunity to discover that there is, that it is fascinating and that its relationships and dispositions are very relevant to understanding our present times. SUE: And, of course, Mrs Thatcher’s comment continued that “there are only individual men and women, and there are families.” Social research also shows that how individuals act depends on social position and social positioning, and also that ‘families’, so frequently invoked in political debates (especially ‘hard-working’ ones), are frequently misunderstood and their varied nature misrepresented. How can sociology help us understand our present political circumstances? JOHN: Primarily by demonstrating the importance of context and social position. But, more importantly, we think that there is a serious risk of a democratic deficit if the drive toward evidence-based policy means that researchers focus on informing policy-makers, rather than the wider public. SUE: Yes, it was precisely that kind of inclusivity that, for us, was so attractive about ‘New Society’. John Holmwood is Professor of Sociology at the University of Nottingham and President of the British Sociological Association. He is a co-founder of the Campaign for the Public University. Sue Scott is Honorary Professor at the University of York having previously held positions at Keele University as Dean of Humanities and Social Sciences and Glasgow Caledonian as Pro Vice Chancellor for Research. Mark Carrigan is a sociologist and academic technologist based at the University of Warwick. He edits the Sociological Imagination and co-convenes the BSA Digital Sociology and BSA Realism and Social Research groups. He is a research associate at the LSE’s Public Policy Group and was formerly managing editor of the LSE’s British Politics and Policy Blog. His research interests include sociological theory, methodology, biographical methods, longitudinal qualitative research, asexuality, sexual culture and digital sociology. I found you through BBCs Thinking Allowed Podcast. It looks very interesting.